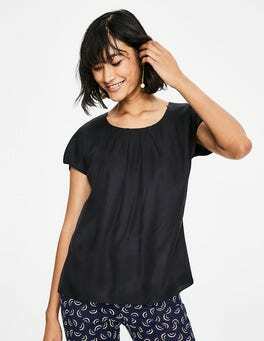 …that falls into subtle pleats, cap sleeves, back button detail and a floaty shape, it's the perfect companion for both jeans and pencil skirts. Oh, and the silk-blend fabric hugs you in all the right places. Add in a semi-fitted shape and you've got a blouse that's got you covered for work or play.